Good morning friends! We finally had sunshine yesterday after several days of drizzly cold weather, and it was enough to get me excited to put up some of my Valentine decor. It's really amazing how much the weather affects my mood and energy level. I definitely thrive on sunshine!! What about you ~ do you decorate much for Valentine's Day? I love the simplicity of that too! Adorable! I never would have thought to put a little banner on the front door. Love the look! Usually no.. but this year I am getting very excited about decorating for Valentine's Day! Working on a few crafts of my own: http://my-day-job.blogspot.com/2013/01/simple-ribbon-wreath-for-valentines-day.html I love the garland on the door! Sooooo cute! Can I ask how you attached it? Thanks Beckey! Just checked out your wreath - it's adorable! And my garland is attached with a small piece of regualar old scotch tape :) so far, so good! I don't do any Valentine's decorating...but this looks simple and adorable! Love love love your stained front door too. I with you, I need sunny days. :) Cute garland. Found you through Bloggy Moms. Love the garland. It is a great simplified touch. Valentine decor can get so cutesie . This doesn't. 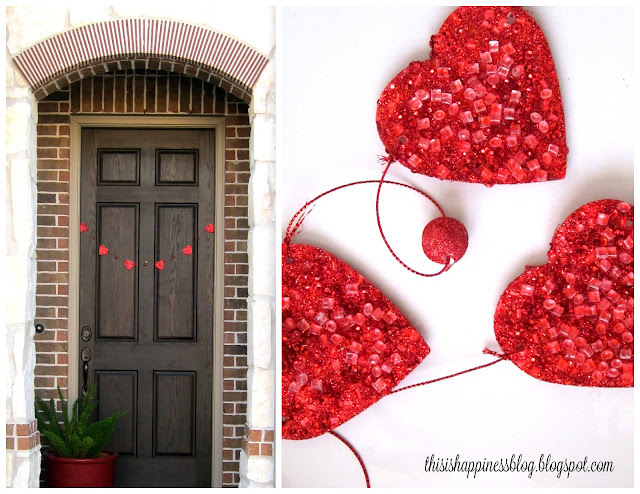 The red hearts banner is all that is needed on your door. It shows up so well with the color of the door and looks simple but very cute. Come look at my Valentine's Day post if you have time. I don't remember how I found your blog a few weeks ago but I have enjoyed your posts. How fun! I love heart garlands. I'm working on some for my home. Love it and LOVE that plant by your front door. What kind is it? Thanks! I think it's a foxtail fern! It's a wonderful plant ~ I've had it for years and it has survived the direct heat well. Stopping by from the link up...I love it! It especially looks great with the color of your door. I like how simple it is. Happy Friday! !